A Venezuelan student now studying in America is speaking out against the University of Wisconsin-Madison’s forthcoming award to Tariq Ali, a supporter of socialist dictatorships including those of Hugo Chavez and Nicolas Maduro. Jraissati offered commentary in last month’s MacIver piece exposing UW’s A.E. Havens Center for Social Justice 2017 Lifetime Contribution to Critical Scholarship Award to Ali. The Havens Center will present Ali with the award on October 19. Previous recipients include Noam Chomsky and Eduardo Galeano. After the recent escalation of violence and deadly protests, we spoke to Jorge for a more in-depth look at the crisis in Venezuela, his personal experiences with the regime, and his hopes for the future of his homeland. inspired to help those afflicted with poverty in his country. He won a leadership position with Voluntad Popular – the opposition party that President Nicolas Maduro has repeatedly tried to disband because he views it as the “military arm” of a U.S. plot to remove him from power. After receiving personal threats, his parents urged him to move somewhere safer to begin his studies. He expressed his deep disappointment that the University of Wisconsin is giving an award to someone who supports the brutal Venezuelan dictatorship. 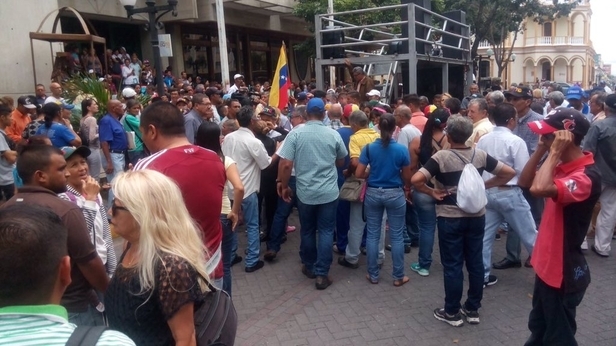 Some news outlets like teleSUR claim that Western media is blowing the situation in Venezuela out of proportion, but Jorge argues they’re not capturing the true horrors. For the launch of teleSUR English in 2014, Ali interviewed Maduro. It was Ali’s first time in Caracas since Chavez died. In the interview, Ali states that “there’s a feeling of sadness but also a feeling of happiness that there’s continuity going on,” referring to Maduro’s ability to carry on the Bolivarian revolution that Chavez proliferated. 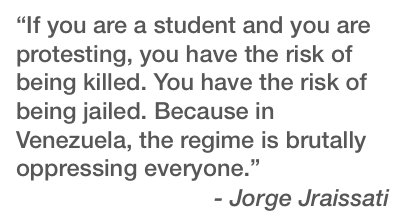 Jorge presents a stark contrast to Maduro’s rhetoric. Pictured: Protesters gather on July 28 in Barquisimeto, Venezuela, to protest against the jailing of their democratically-elected mayor. Photo by Jorge Jraissati. Brett Healy is the President of the John K. MacIver Institute for Public Policy, a Wisconsin-based think tank that promotes free markets, individual freedom, personal responsibility and limited government.